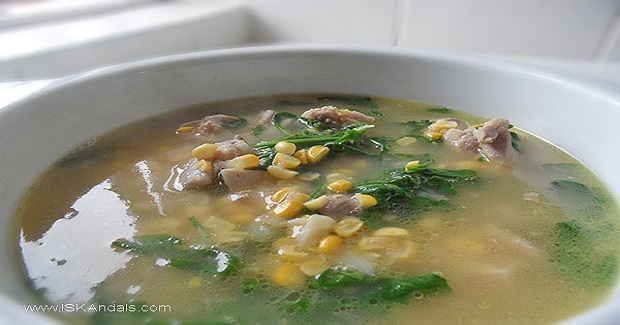 Chicken And Corn Soup Recipe - Gutom Na! Posted on Friday, February 17th, 2017 at 4:27 am. Unhusk the corn and remove silk strands. Using a sharp knife, separate the kernels from the cob. Set aside. Prepare the rest of the ingredients. Heat oil in a big saucepan. Saute garlic until fragrant. Add chicken and sauté for about a minute. Season with patis and freshly ground pepper. Continue to cook for another couple of minutes. Add onion and sauté until transparent. Add chicken stock and bring to boil. Add corn kernels, cover with a lid and bring to boil. Lower heat and simmer for 30 minutes. Taste. Adjust seasoning with patis and pepper, and if necessary with a bit of salt. You may scoop out the chicken so as not to overcook or leave them to cook for another 10 minutes. Turn off the heat. Add the rocket leaves and close with a lid. Leave for a minute or 2. Serve warm.